Welcome to the sshg_promptfest! 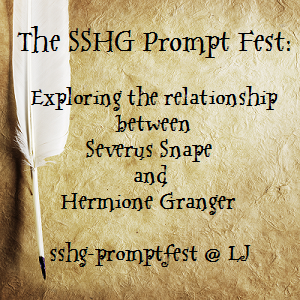 The SSHG Prompt Fest is an anonymous, prompt-based fest that explores the relationship between Severus Snape and Hermione Granger with a showcase of fan works. To participate, sshg_promptfest member-watchers will offer prompts to the community, claim prompts from the community, and produce fan works for the community and its followers. SS/HG (het) and SS & HG (gen) fan works of any rating will be accepted from artists and writers. Why an SSHG-centred prompt fest? Simple: SSHG is love, prompt fests are easy on everyone involved, and while the Exchange mods are mulling over whether or not to run the sshg_exchange again taking a well-earned holiday, I thought it might be nice to provide them with an opportunity to enjoy their favorite pairing without having to do any work. and join and watch the community. Any questions about the SSHG Prompt Fest may be directed to sshg.promptfest [at] gmail [dot] com, or asked in reply to this post. I'm not a writer[/artist/crafter/vidder]. Can I just submit prompts? If you're 18 or older, yes, of course! Can I participate in the fest if I don't submit any prompts? If you're 18 or older, yes, of course! What's your extension policy? I won't be offering extensions. The fest's deadline is firm for everyone—except for any pinch-hitters whom I might tap to ensure a full fest of at least 30 entries—because I'm only one mod, and like everyone else, my fandom time is limited. Will you accept cross-over prompts/fics? Sure! If you do write a cross-over, however, please provide some background material for your non-HP elements so that their inclusion is understandable to readers unfamiliar with the fandom in question—and remember that the relationship between Severus and Hermione must be the primary concern of your work. How will I know what to write[/draw/craft/vid] if I don't know who I'm writing[/drawing/crafting/vidding] for? I'll include your prompter's name in your assignment email so that you don't inadvertently ask him or her to beta for you. That said, because the SSHG Prompt Fest isn't a gift exchange, you'll be taking inspiration from your prompt rather than your prompter; if you concentrate on producing a fan work that you enjoy, chances are that everyone else will enjoy it, too. Are you going to beta my fic before it gets posted? No, I don't beta participants' works; it's your responsibility to arrange a beta well before the deadline so that you can have your work beta'd in time to submit it by deadline. Don't you usually offer private previews before posting starts? There's nothing about them in the rules. I capped participation at 30 people/creative partners in my previous fests, which made offering previews feasible. With no participant limit in the SSHG Prompt Fest, I thought it wise not to promise previews. That said, if I'm in a position to offer them to interested participants after the deadline passes, I will. Are you posting entries on a first-come-first-served basis as usual? The earlier you submit an entry, the earlier it will post. For this fest, however, I reserve the right to move entries around a bit to avoid posting similarly-themed or especially long works back to back. Can I write novel-length fic for the Prompt Fest? Can you? :P If you can produce an appropriately formatted, beta'd novel by deadline, go for it! Just bear in mind that I am not offering extensions for any reason. If I see a gen prompt that gives me a pairing fic bunny, may I claim it? Only if you're going to write a gen fic. Prompts must be honoured. I have a question: can "art" include craft, like it did with the SSHG Exchange? And another question: is there a reason why the images for art have to be so small? 600x800 isn't very big. Yes, of course! Images of that craft just need to meet the size requirement. The size requirement is the same as it is for the Exchange, and I use it so that art can be clearly displayed in an entry (and because I haven't the skill/knowledge or money to host art anywhere other than in the mod's Scrapbook). I wouldn't mind accepting a "rules size" image as well as a larger one to be linked to underneath of that one as long as the Scrapbook can bear it. On a related note, if anyone wants to submit a vid, I can have my 24-hour tech support (husband) show me how to open a fest-related YouTube account. I just need to host all artwork for the fest for the sake of anonymity during the fest's run, and later, so that if a participant leaves fandom, his or her work won't disappear from the fest. Question: Will you accept essays if a prompt gives me an essay bunny? Since the fest was designed to showcase art and fic and people won't be prompting for essays, I think not. If the fest goes well and I decide to run it again, however, I'll consider expanding the categories. Prompt collection begins on Sunday, 10 March, so please promote the SSHG Prompt Fest!